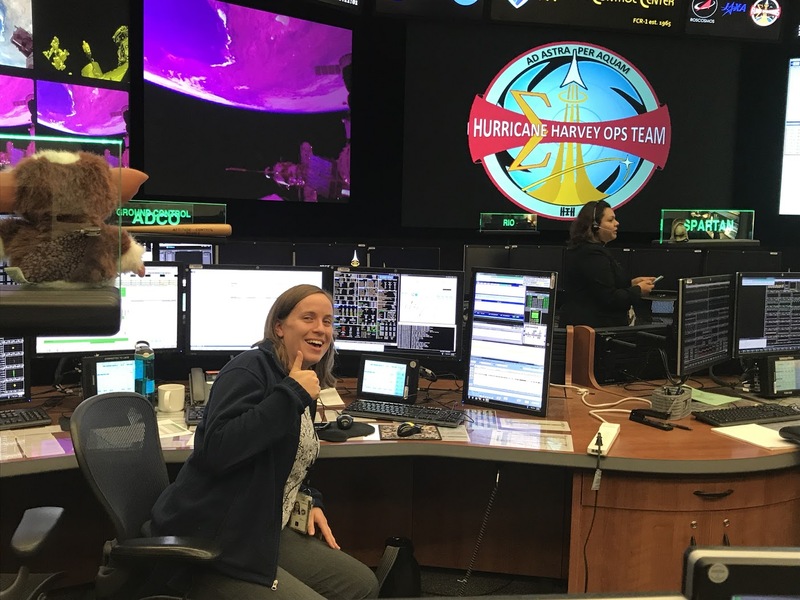 Rocket Women are highlighting the untold stories of the dedicated Orbit1 team that remained in Mission Control at NASA Johnson Space Center to tirelessly battle Hurricane Harvey, keeping the space station flying and the astronauts onboard safe. The third of this special 4-part series (Part 2 here) features Orbit1’s Fiona Turett, ADCO – Attitude Determination and Control Officer in NASA’s Mission Control. Her job is to manage the Motion Control Systems of the International Space Station (ISS) – ‘the systems the ISS uses to know where it is in space, what direction it’s facing, and then keeps it where we want it to be’. Fiona and her colleagues slept in the former NASA Space Shuttle mission control room for days through the hurricane, supporting communication from the ground to the space station and it’s occupants, keeping them safe. What was the path to get to where you are now? How were you inspired to consider a career in the space industry? Both my parents were math professors, and so I grew up with a love for math and for learning in general. We had a small telescope and a few books about stars, but I didn’t know more about stars than the average little kid growing up. The first time I remember specifically being interested in space was in 7th grade. We had to do a project about a topic of our choosing in one of my classes, and I chose the solar system. I found the whole thing fascinating, and ended up going way above the requirements because I was just enjoying it so much – I wrote a short report on each planet and the Sun, and made clay models of each planet to place in a hallway at school to show relative distances and sizes. At that time, I would have said I wanted to be an astrophysicist, though I don’t know I really knew what that means. My best friend and I spent our spring break at Space Academy in Huntsville, AL. As part of this, we participated in simulated missions. I was an astronaut in one of them, but the one I loved the most was when I was the Flight Director in Mission Control. The next year, my best friend and I spent our spring break at Space Academy in Huntsville, AL. As part of this, we participated in simulated missions. I was an astronaut in one of them, but the one I loved the most was when I was the Flight Director in Mission Control. As a freshman in high school, I had the chance to join a high school robotics team. We participated both in FIRST (For Inspiration and Recognition of Science and Technology) and in a local competition where I lived in Michigan called OCCRA (Oakland County Competitive Robotics Association). OCCRA also had a girls-only tournament as one of its competitions, and that was an amazing opportunity to get to be involved in all parts of designing, building, and controlling this approximately 70kg robot playing a strategy game. I was hooked. I continued to be very involved in robotics throughout my high school career. This convinced me that I wanted to do engineering, not science, but I did still want to connect it back to space. My senior year, I heard about an internship program at NASA’s Goddard Space Flight Center in Greenbelt, MD called NASA Robotics Academy. I worked with a team of other interns on improving a therapy robot designed to work with kids with autism at a small company with connections to NASA. I then started working on my degree in mechanical engineering with a minor in aerospace at Washington University in St. Louis. There, I had the amazing opportunity to participate in a nanosatellite project through the Air Force, as well as to fly two experiments on NASA’s Weightless Wonder (also known as the Vomit Comet) airplane. It was an amazing few years of school, with NASA internships each summer. I graduated in 2009 and was offered a job in the Safety and Mission Assurance area of JSC, working with space shuttle propulsion. Two years later, when the shuttle program ended, I was lucky enough to take a year off of work and volunteer in Nicaragua to fulfill some other passions of mine. I came back from there in 2012, and have been working in my current group in MCC ever since! One thing I love about my job is that there isn’t a typical day! I work with the Motion Control Systems of the International Space Station – the systems the ISS uses to know where it is in space. What does your average day look like in your role? One thing I love about my job is that there isn’t a typical day! I work with the Motion Control Systems of the International Space Station – the systems the ISS uses to know where it is in space, what direction it’s facing, and then keeps it where we want it to be. Some days (or nights!) 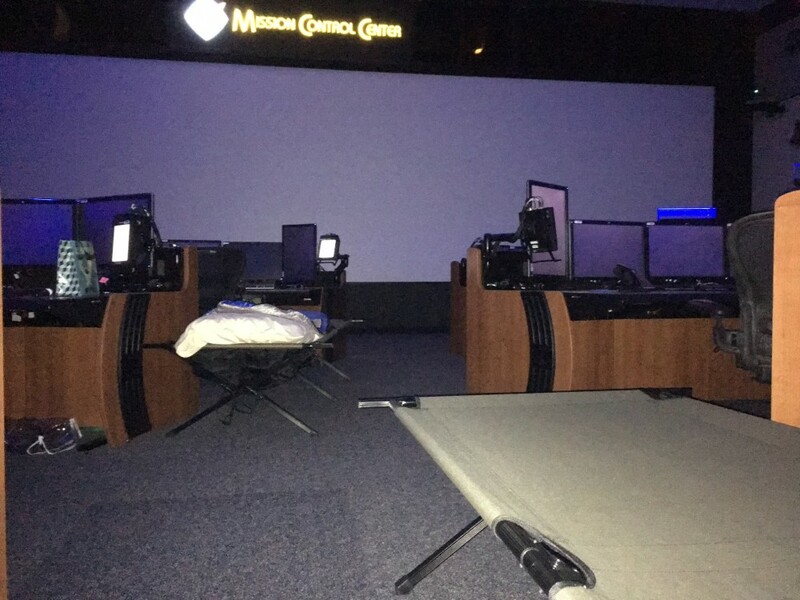 I may be working on console in MCC at the ADCO – Attitude Determination and Control Officer – console, other days I may be teaching astronauts or people who are in training to be flight controllers, and other days I might be running a simulator on the ground. It’s very dynamic. One of my favorite tasks is mentoring our new employees as they work towards their first ADCO certification. Being successful in this role requires both a lot of technical knowledge and a lot of soft skills like teamwork and communication. I love the challenge of helping each individual trainee to achieve their potential, and the joy of celebrating with them when they do. I actually wasn’t scheduled to be on console for Hurricane Harvey. I was planning for a quiet, wet weekend stuck at my house. Describe your experience of being on-console during Hurricane Harvey? I actually wasn’t scheduled to be on console for Hurricane Harvey. I was planning for a quiet, wet weekend stuck at my house. However, the person scheduled to work Orbit 1 (the night shift) lives about 30 minutes away. He was super proactive and tried to come in over 2 hours before his shift, but the roads were already flooded where he was. I live just a few minutes from NASA, and got a call from my manager at about 9:15pm on Saturday night asking if I could cover the shifts. I had already thrown some clothes in a bag just in case, so I added some food, grabbed my pillow and suitcase, and rushed over to work. The shift didn’t start until 11:30pm, but I could tell the weather was just about to get bad. I am so thankful my coworker was so proactive and tried to come in so early, because I was able to safely get in before the weather got too bad. With that being the worst night of the storm, no one in Houston slept. Adrenaline definitely kept me awake as we saw more and more reports of flooding around us. That first night, I was worried about how awake I’d be since I hadn’t been able to sleep shift to prepare for nights. However, with that being the worst night of the storm, no one in Houston slept. Adrenaline definitely kept me awake as we saw more and more reports of flooding around us. FCR-1 (the flight control room we fly ISS from) is in the middle of a big building, and it was a bit surreal because we couldn’t even hear the storm – I never saw it with my own eyes. That shift, the hardest part was not being too distracted by the surrounding events and being able to focus on ISS operations. That shift, the hardest part was not being too distracted by the surrounding events and being able to focus on ISS operations. 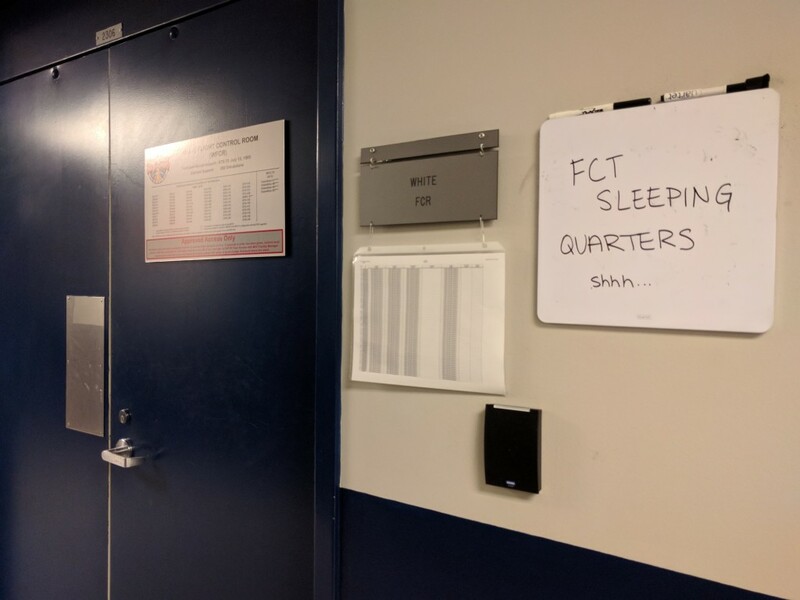 After that, I set up a cot in the front of the WFCR (where we flew Shuttle from – now we use it for training) and tried to sleep. That’s basically how the 4 days went – work the shift, try to get as much rest as possible, and try to check on friends and family without losing focus on work. I was lucky to have two other people from my discipline also in the building, so we were able to trade off either at normal shift handover times or whenever needed to make sure folks were as rested as possible. That’s basically how the 4 days went – work the shift, try to get as much rest as possible, and try to check on friends and family without losing focus on work. The whole experience was a bit surreal. But, as I told my mom on the phone one day during it, I was probably in the safest place I could possibly be, and I was dry. I tell people who try to thank me for what I did that the people who they should thank are the first responders and folks who were out rescuing people. They put their life on the line. I simply did my job in order to make sure ISS was safe, and allow the rest of Houston to focus on the hard work. What was the hardest part of maintaining ISS operations from MCC-H during Hurricane Harvey? The hardest part for me was definitely maintaining focus. It’s very important to be focused on the task at hand when on console, because we have to be ready to react in an instant if there is a malfunction in order to keep the crew and vehicle safe. Usually, it’s not hard for me to be focused on console, but it was really hard during Harvey. I constantly had other worries – wondering what the latest alert on my phone would say, wondering the status of my house, wondering if all my friends were safe and dry. It was hard to put that all aside. I was able to do it while on console because that’s my job, but I will say that I didn’t sleep well during the days because my mind was just racing and I kept wanting to check in on people. My roommate did an amazing job keeping me updated on the status of the house and checking for any issues, which was a huge relief. It would have been much more stressful if she hadn’t been home and able to give me updates. Has this experienced changed you from a professional or personal perspective? Probably both. One thing I have always loved about my job is the shared mission and the teamwork, as well as the high standards each person is held to. This experience just made me appreciate that even more. We have a document called the Foundations of Flight Control, which is the basis for how a flight control must act – tough, competent, responsible, etc. I saw my colleagues demonstrate every single one of those virtues during Harvey. Nobody complained, nobody shirked their responsibility. It was an amazing display of teamwork, and just strengthened my admiration for the whole MCC team and my gratitude for having the opportunity to do this job. Personally, the experience of being at MCC just helped me realize how important each small piece of the puzzle is. In the grand scheme of Houston and what Harvey did, the work I did was miniscule, but it was important and my duty was to do it. I appreciate the importance of doing the task assigned to me well even if it feels insignificant even more than I did before. I also had a really cool experience corresponding with a 4th grade class in Naperville, IL during my time in MCC. A friend of mine who also works at NASA was visiting her fiancé, and his sister teaches this class. 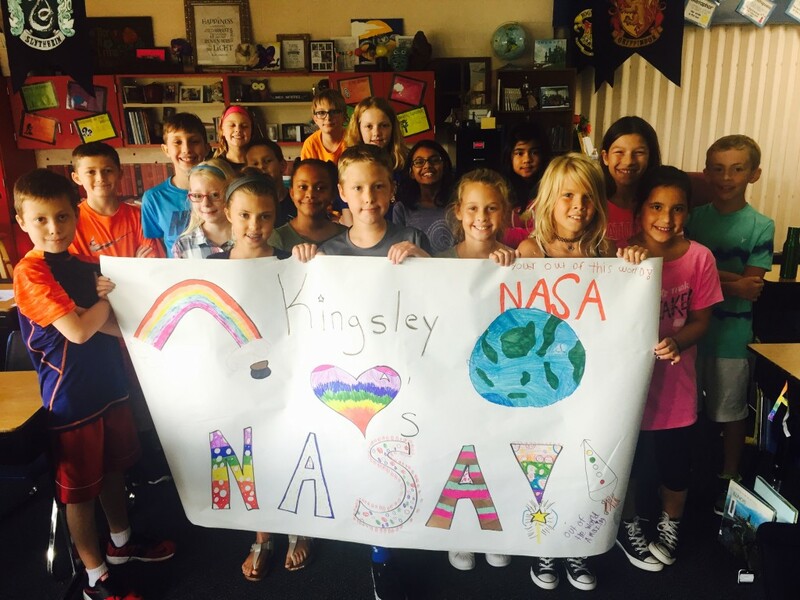 When they were talking about the storm at school, she told her students that people were staying in Mission Control around the clock to keep ISS safe during the storm. 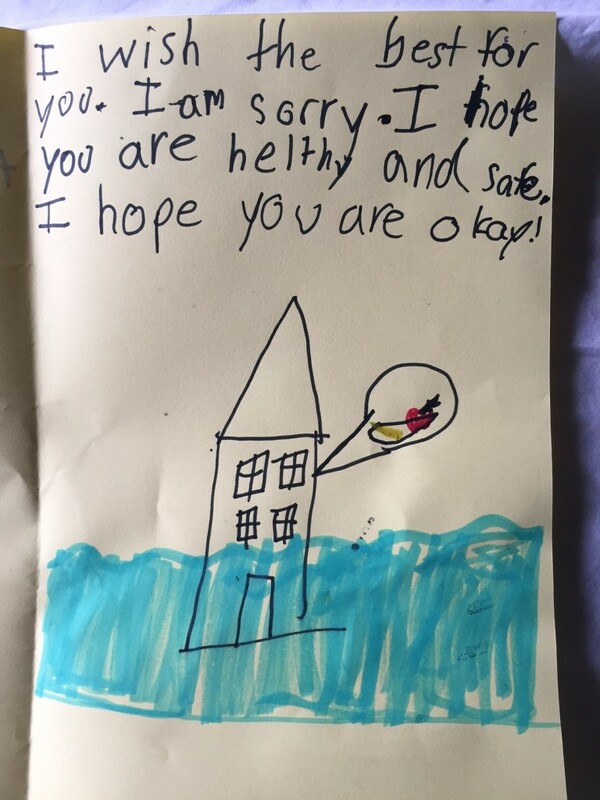 The kids wanted to make some cards, which my friend sent to me. I was able to forward them to everyone else staying in MCC as well as the astronauts on ISS, and I think the well-wishes brightened all of our days. I wrote a letter back to them the next day to thank them. I hope that we were able to inspire some of the students, and I am constantly grateful to be in a position to interact with kids and help them dream big. This is a hard question because I seriously love my job and find a lot of it rewarding. One of the most rewarding, though, was changing the way we did Soyuz undockings in order to be more efficient with propellant usage, and then seeing that be executed successfully and bring astronauts home safely. It’s cool to see the little marks we can leave on the space program, and I hope I’ve been able to make the ISS a little better in the past five years. Of course, working Soyuz undocking and landing shifts is very rewarding because they end with three people safely back on planet Earth. Working Soyuz undocking and landing shifts is very rewarding because they end with three people safely back on planet Earth. If you had one piece of advice for your 10-year-old self, what would it be? Oh gosh – I think 10 year old me probably could have used a lot of advice! If I had to pick one piece, I’d say don’t lose sight of the people involved in whatever you do. I have found that every rewarding part of my career has involved other people either working with me on a team, working on something to help other people, or helping other people in their own career or life. I love engineering and I’ve always been super curious about the world around me, but keeping the focus on the people is what makes it rewarding and makes you easier to work with and more likely to network with the right people. 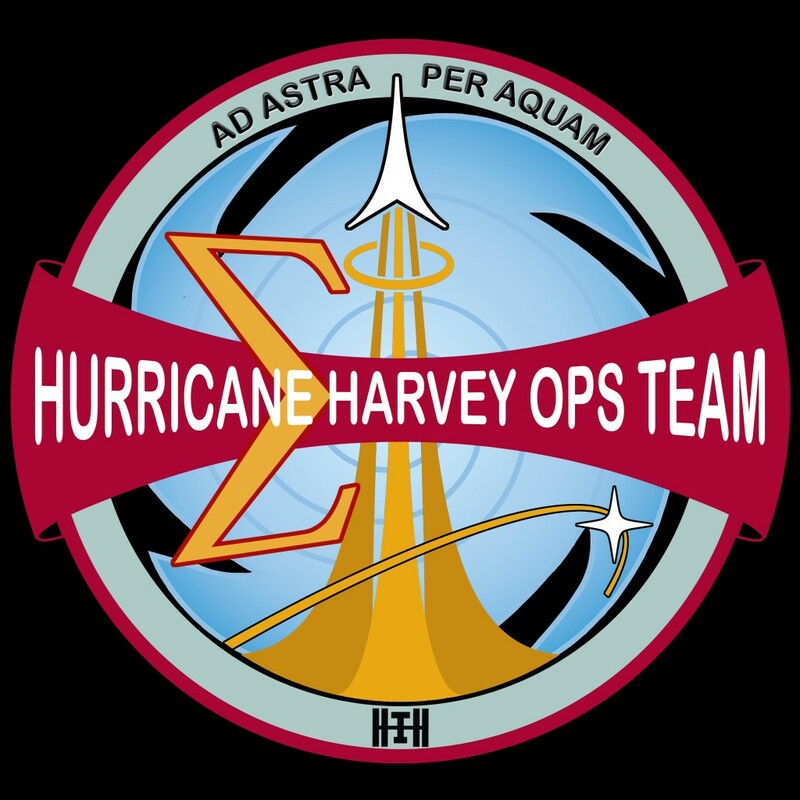 I designed a patch (the motto, “to the stars through water” is courtesy of our Flight Director Anthony Vareha) for our Hurricane Harvey Ops Team. NASA’s big into mission patches, and this experience sure felt like a mission. I couldn’t have asked for better teammates for our mission this past week.